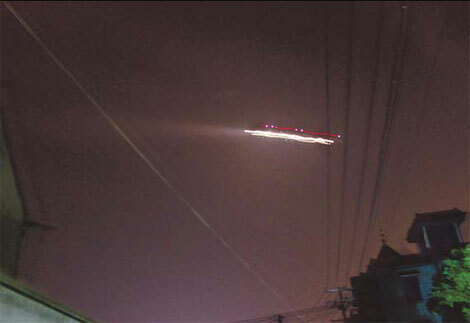 SHANGHAI - The unidentified flying object that disrupted air traffic in Hangzhou for an hour on Wednesday remains, well, unidentified. "No conclusion has yet been drawn," Wang Jian, head of air traffic control with the Zhejiang branch of the Civil Aviation Administration of China (CAAC), was quoted by Xinhua News Agency as saying. Some media have speculated the UFO might be a private aircraft, based on the increasing number of privately-owned aircraft in Zhejiang province. But Wang said the possibility it was a private plane was "just a guess." A source with knowledge of the matter, however, told China Daily earlier that the object had a military connection. Xiaoshan Airport was then closed at 8:45 pm over security concerns, and only resumed operation at 9:41 pm. A dozen inbound flights were diverted to nearby airports and six outbound flights were delayed for three to four hours. According to an estimate by Shanghai-based Evening News, more than 2,000 passengers were affected. It was the first time an airport in China has been shut down on such short notice due to a UFO, said a staff member with the CAAC of East China, who declined to be named. "We should first find out how the owner got the approval to fly the object," said the staff member, adding "even a fire balloon needs to get the authority's permission before lifting off." The twinkling object could have been a light below the horizon reflecting on an airplane flying very high, given good visibility in the sky, said Zhu Dayi, who works at the Shanghai Observatory, adding such phenomena usually happen around an hour after sunset. "If the speed of the twinkling object is extremely high, it could be a military aircraft," he said, "But no conclusion can be drawn now, as the information is limited." According to airport staff, it is still not clear which authorities should be held responsible for dereliction of duty - if there were any. The CAAC of East China and the airport divide their areas of responsibilities according to the craft's altitude. As to who should pay for losses to the airline companies whose flights were diverted, an industry insider said those costs should be borne by the owner of the unidentified object.